Since its establishment, the Community legal order has dealt effectively with the need to make compensation to individuals who suffer wrongful acts. The relevant provisions have been gradually elaborated and refined over the years, particularly in the case law of the Court of Justice. The present book contains papers by some of the most distinguished academics, practitioners and members of the judiciary, who deal with the various aspects of this legal remedy. 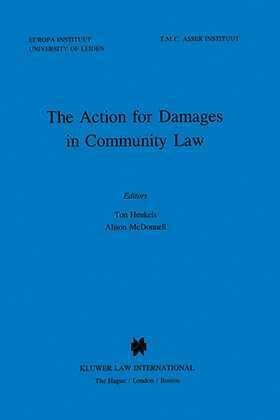 It provides a comprehensive collection of essays, with topics ranging from the substantive conditions under which non-contractual liability of the Community arises for different kinds of legal acts, to questions of interest in damages and the Community's contractual liability. Several of the contributions examine important recent developments in Member States' liability for breach of Community law, both before the Court of Justice and in national courts. Practitioners will appreciate the extensive treatment of the Court's case law, in the context of the broader themes and relationships between Community law, national law and international law.